Between 14-18 July 2015, on each day, I will be making a post in celebration of International Authors’ Day, featuring reviews of works by Kenneth Grahame, J.L. Borges and Algernon Blackwood, authors whose works have been formative inspirations for me. These posts will be made as part of a Blog Hop as can be seen and visited through the links at the bottom of each post. Plants: how do they inspire you? This Blog Hop is hosted by Debdatta, please visit. In The 23 Club, Erik Chalmers, a landscape architect, follows his obsession to build beautiful and captivating gardens–this time to The Empty Quarter. 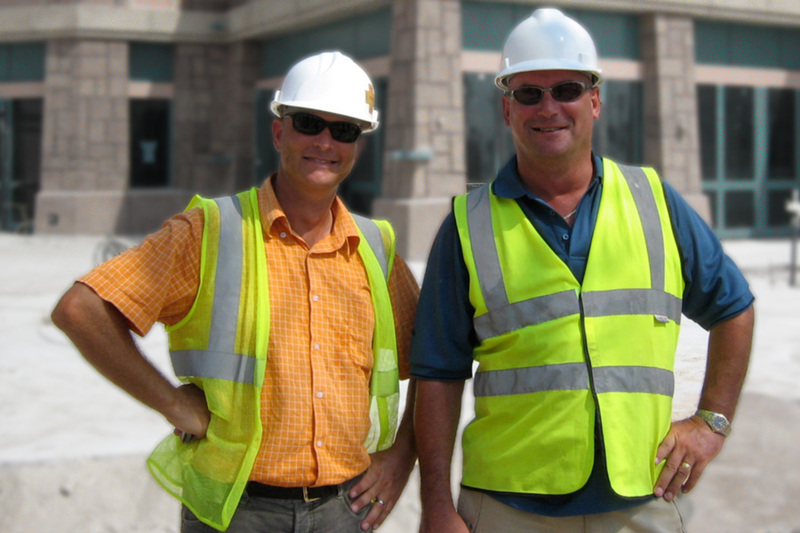 Erik Chalmers, American born and bred professional landscape architect, used all his skills to manage these very large, complex iconic projects in the Arabian Peninsula. He knew that the multi-cultural and technical complexities required not simply a left side of the brain number crunching iron will; but they also required what he called…performance art. What is the magic–what are the skills required to succeed on these huge complex projects being designed and built in such challenging and downright dangerous environments? Erik Chalmers’ post project notes give insight into his successes. But Erik Chalmers, for the first time in decades on an assignment without his wife Madge, was about to learn if he had done one project too many and lost his one true emotional certainty, his one true root. Chalmers felt what he had missed over the past eight months–the fullness of the water, the plants, the soil, the wholeness–it was holistic, it was an existential comfort. Following is a short narrative from Chapter 13: Pilgrimage, that imparts some of the landscape connections in The 23 Club. Immersed in the contemporary culture of Dubai and Abu Dhabi, against the backdrop of the Empty Quarter, The 23 Club tells the inside story of how an iconic project gets built in the oil rich, Gulf region of the Arabian Peninsula. Chalmers was returning after eight months on his own. Nobody in the UAE called him Erik. It had been eight months of Chalmers. Eight months of taking care of his own meals, his own shopping, his own laundry. It was the little stuff that informed his daily life culture. It was the little stuff that built up…big time. As the train took Chalmers closer to his stop, his thoughts turned to Madge. He was returning to his shared spaces, his shared life. Chalmers was becoming Erik again. He missed Madge; but he was uncertain how this return would be. Long distance communications always filtered, always blurred emotions. Chalmers recalled the worst of his time away…he had not been able to hide his week in the hospital from Madge. He was supposed to have gone to Singapore for silk; but her worst fear came true. He had been injured in an automobile accident and hospitalized. She suffered to hear about it from distance. Sorry just did not cover it…from either side. 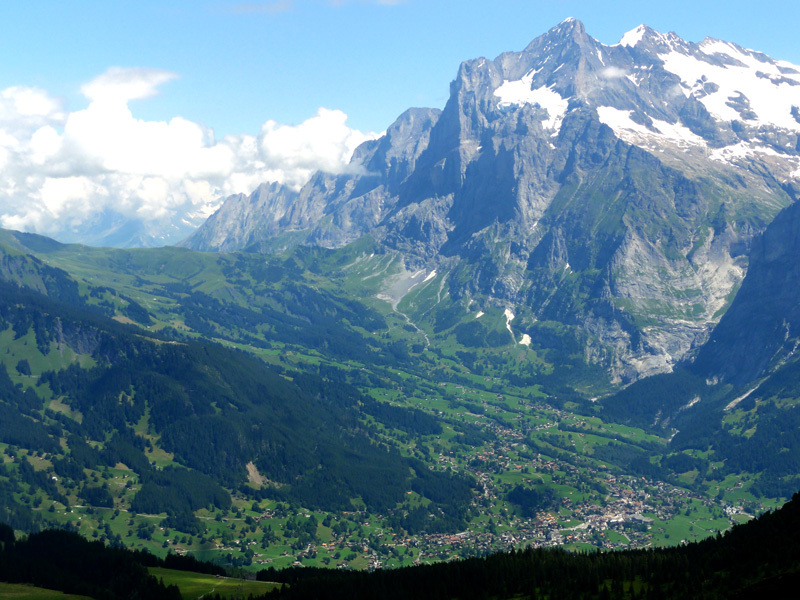 He arrived at Lauterbrunnen and thought, it won’t be long now. He transferred from the train to the funicular. It was late in the afternoon and the sky was overcast. This time of year there was little difference between the valley village and the small plateau up where he and Madge lived. Fall plants were already naked of leaves. The first big snow could come any day. The temperature 5ºC or below; frost threatened. As the funicular rose, Chalmers recalled his excitement nearly nine months ago when he was asked to help fix the first five star resort destination deep in the Empty Quarter. It had been about the challenge. It had been about his joy in providing beautiful gardens for people. Now the job was complete. The gardens were a success. The owner was satisfied, happy. That world was finished. Now he was home. And he was worried. Had he traded off something of emotion and trust, something he had held closely with Madge, just to build a couple gardens? The open forum of majlis functions from small groups of close friends, up to and including the largest groups of people speaking directly to the rulers of each Emirate where anyone can speak with the ruler at majlis. 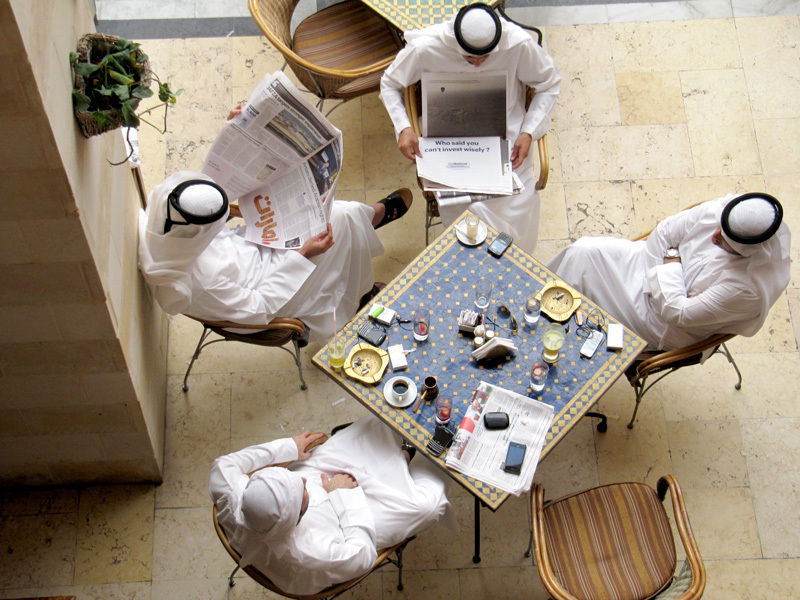 It is relaxed as is traditional at majlis–relaxed as the four Emiratis in the above image–note that three of them are wearing aqal headresses and one is wearing a hamdaneya headress. Erik Chalmers, Jean-Claude Thibaut and Theuns van der Walt share a social night of conversation over dinner and televised football with a small group of Emiratis who have a special interest in the Liwa Qsar Project under construction in the Empty Quarter. Following is a short part from Chapter 11: Villa Majlis to impart some of the landscape feeling of The 23 Club. 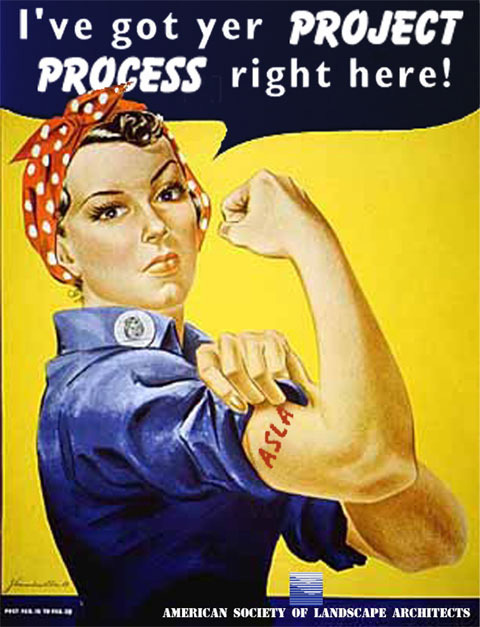 What happens when popular jargon meets a larger than life, a larger than time landscape? What is sustainable about something that is ‘always shifting’ Or, rather, is ‘always shifting’ the most fundamental component of sustainability? Is sustainable larger than time, is it larger than eternity? Ha!! The more attention paid to popular jargon, the more folly suffered! Fairuz, an Emirati from Liwa Oasis taking personal interest in the Liwa Qsar project, Jean-Claude, the Belgian Ethnobotanist, and Erik Chalmers had much in common. They shared interest, yet with varied perspectives, on the sands (rimal) and on the Bedu life style. They sat down together. Fairuz asked for dates and kaouwa, Arabic coffee, which was then roasted, ground and prepared on a side table next to him. Chalmers and Jean-Claude joined him. Traditionally taken in restrained amount, kaouwa and dates were a sweet, soft, tender, buttery, room temperature date washed down with a thimble full of the hottest, bitterest, freshly brewed, cardamom and clove flavored coffee. Following the kaouwa, Chalmers took the opportunity to explore a topic which had been on his mind since hearing Kelvin Isley the other day describe his experience of an almost unearthly, powerful rhythm of the heat emanating from the sands. He drew on Thesiger’s recognition of the exceptionally strong power of the sands. Thesiger had observed in the Bedu, people intensely occupied with the sands, they never commented on the beauty of the sands, the sky, the night, or the sunset. Jean-Claude listened carefully to the question and internally put it into a larger context. He could see the desire among certain social groups for sustainability as a desire for secular eternality, a contemporary replacement for the stability traditionally supplied by religions. As far as he was concerned it was short sighted, a passing fad, ignorant of powers greater than the human mind and intelligence, ignorant of the powers that moved the sands, that put the sands in place. But, at the same time Jean-Claude valued these social efforts, seeing them as an opportunity to get more people in touch with their ethnobotanical roots. Sometimes the white collar mercenaries wear blue collars. Can it ever be so simple as good guys versus bad guys? Naw, they are all in the same game, workers or managers…they are all mercenaries–working for their families, working for themselves–all on contracts. All temporaries. All in the heart of the Empty Quarter. All with uncertainty, dead ahead. If you, the reader have been born in a temperate climate, you can not understand how beautiful this green is to the humans who live around the edges of the Empty Quarter. 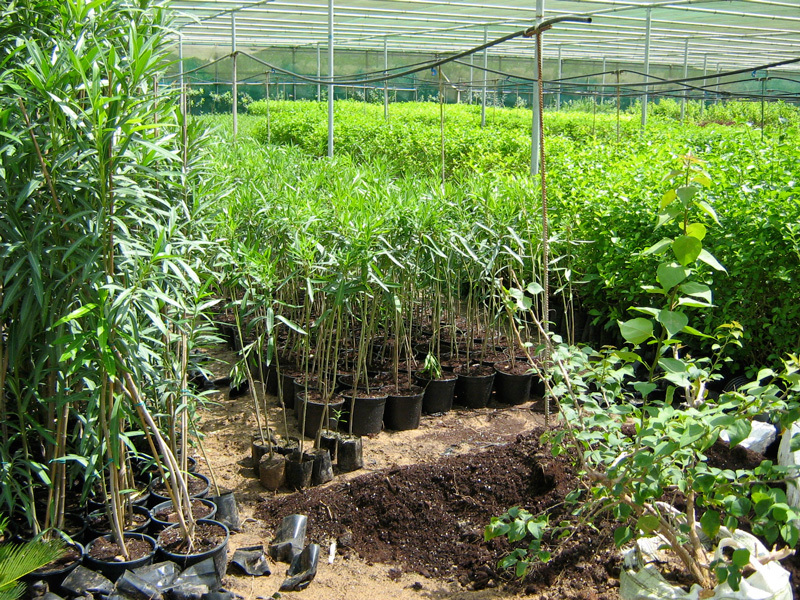 To slake that green thirst, millions upon millions of plants are being grown in the nurseries of the United Arab Emirates. MIA made a break though with her music behind SlumDog Millionaire. She strips away all pretense and calls it like it is ‘…bonafide hustler…making my name…all I wanna do is…take your money.’ Erik Chalmers comes face to face with this when he visits the huge plant nursery supplying his project. 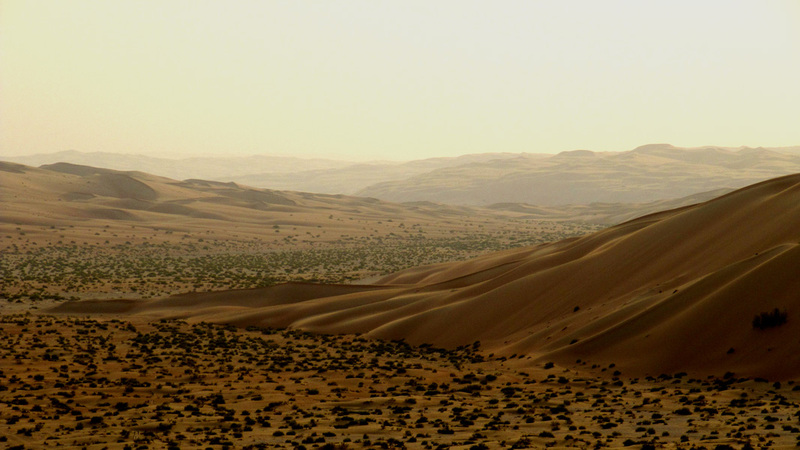 And the nursery–it, too, is in the Empty Quarter. Following is a short part from Chapter 8: The Nursery to impart some of the landscape feeling of The 23 Club. Twenty five years ago in Southern California, nurseries like Monrovia, Keeline Wilcox and ValleyCrest had rows upon rows of trees, shrubs and ground covers, each properly pruned and grown to near perfection–seemingly unlimited quantities in any size you wanted. Selecting plants there was the same as going down the breakfast cereal aisle in a large American grocery store–huge selections, multiple sizes of each, in massive quantities. Just like cereal boxes, the plants in these nurseries were labelled, well displayed, properly set out and all uniformly healthy. That sophistication and mastery of horticultural and logistics processes integral to plant growth was a spectacular achievement that Chalmers had never fully appreciated–until he worked with the pirate landscape contractors of the Middle East. In the Western Region of Saudi Arabia in the early 1980s, a large new town was under construction and street trees were part of the infrastructure work. That was the first time Chalmers had seen on a competitively bid, huge project scale, plants being grown in the used empty tin cans, normally thrown out from labor camp kitchens. Always rusting, the cans were lucky to have drainage holes and they were always stacked cheek-by-jowl to save on land rental costs. Plants were hand watered seemingly by chance. And pruning equipment? Just never around. The captain of these pirate landscape operations was invariably a French, Belgian or Afrikaner character, meanness carved all over his face–a Kepi blanc, a French Foreign Legion escapee at best or, at least suitable for a starring role in a Werner Herzog movie. Everyone who worked for the captain was a day laborer at the cheapest rate. If the day laborers would have come from farm backgrounds in Bangladesh, or Sri Lanka–eh, never such luck. The Liwa Oasis is a 100 kilometer long series of loosely linked sabkha valleys, each valley individually subtended by the sand dunes. The beauty of these Empty Quarter dunes to the eyes of every Western visitor is an undeniable journey into private dreams, hopes…mysteries…breath taking…on infinite levels! Sustainability aside, the spectacular essence of Erik Chalmers’ new project, a five star destination resort in the heart of the Empty Quarter, is that guests and visitors would be able to safely and securely absorb the sand desert beauty, without fear of death. This journey, this path…this road into the heart of the beauty, or as some knowledgeable people put it, into the beast of a sand desert known as the Empty Quarter…winds on and on–weaves and weaves deeper and deeper into the awkward, the enigmatic, the mazey sand emptiness. Only the thin, white gatch road remains as the string to take you back, the tenuous cultural connection back to civilization…as you once knew it. Rudyard Kipling is temporarily unfashionable these days–but a century ago, in these strange, even unfathomable landscapes, he called the West Asian cultures he encountered, as they were–difficult and dangerous for Westerners. On his journey into the Empty Quarter, Erik Chalmers will finally arrive at his project site and meet the white collared mercenaries and privateers who have contracted to work in this difficult and dangerous region of the world. Following is a short part from Chapter 7: Liwa Qsar to impart some of the landscape feeling of The 23 Club. The dream is the mirage. In the West, the Empty Quarter has always been an elusive froth, an ambiguous froth, a strangely arid yet attractive froth–whispering mystery and romance, providing an oddly enticing whiff from an evanescent bouquet full of ethereal promise. That is the mirage; and, for the sake of his success on his new project, Chalmers hoped it would be different. He did not need mirages on the Liwa Qsar project site. Spectacular red sunsets rewarded the end of every day. The project site had been chosen to give the guests a luxury room looking west at a view framed by some of the largest and steepest red sand dunes in the Empty Quarter. The project was about providing shelter, a comfortable, an elegant shelter, protecting from the uncertainties, from the threats in this beautiful landscape. Now Chalmers would meet the key players, living and working and constructing an iconic resort in this sweaty 50˚C world, in the arid, inland, heart of the Empty Quarter. 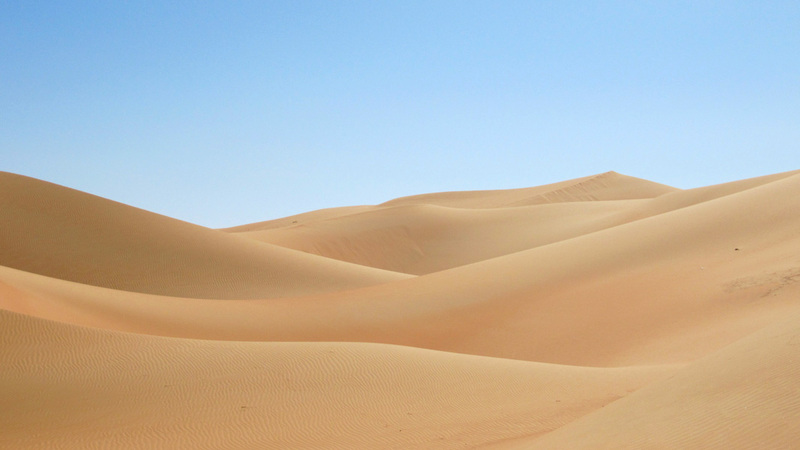 The Empty Quarter, how can beauty be so…empty? In Desert Sirens, Jean-Claude Thibaut, the Belgian Ethnobotanist, describes what many ‘feel’ in the presence of these odalisques–these seductive sand dunes…their beauty simply overwhelms. 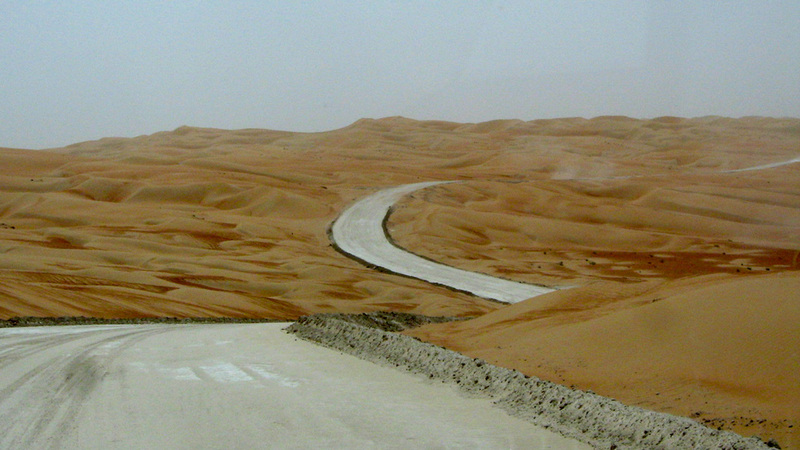 Following is a short part from Chapter 6: Rub al Khali Inland to impart some of the landscape feeling of The 23 Club. If there could be a ‘Twilight Zone’, an ‘X-files’ event on this trip, this next area would be the setting. Chalmers and Jean-Claude appeared to leave contact with civilization behind when, after enduring thirty more kilometers of increasing shamal, the wind and sand storm, they took the Hameem turnoff. There was no other traffic. The road was well asphalted, two lanes, one in each direction and two full asphalt shoulders. The verges on each side had the Sheikh Zayed shelter belt tree plantations, as always, laid out linearly in agricultural fashion. These trees were young, in their first two or three years. More noteworthy though, was the desert, it was stirred, riled, mad with wind. Reduced visibility now limited their maximum speed to less than 70kph. “Have some patience, mon ami, it always takes a while for me to settle in, to absorb the aura of this strange sand desert.” Chalmers squirmed and looked across, querulously, at his friend. The sun–the sun was a dim disk–by the storm nearly blotted out of the sky. Their visibility was reduced to less than 200 meters and the sand was swirling, drifting, dancing, racing over the asphalt. As they drove on, the previous mini dunes of the sabka coast grew larger, and each dune, being forcefully reshaped by the relentless shamal wind, had a roaring top. After driving with buffeting winds and poor visibility for an arduous eighty kilometers, they came to the first paved intersection. It had barely readable signs for oil and gas rigs–Asab to the west–Saafi Al Naar thirty four kilometers to the east, in the direction of the Saudi and Omani borders. They could see just by the side of the road, a small one story white stucco building. Stopped in front of the building, on the road shoulder were seven or eight large, heavy duty construction hauling trucks–because of sandstorm poor visibility, their warning blinkers flashing. Chalmers and Jean-Claude stopped, too.